What Are The Best Kicking Balls? One of the most important things about choosing a football for kicking is for you to get the correct size. For kickers and punters ages 13 and older we recommend a High School sized football. Many will have the letters ‘NFHS’ (National Federation of State High School Associations) stamped on the football. This stamp basically means it has been certified for use by the NFHS which is an organization / governing body / rule maker of HS Football. Our favorite HS and College (typically HS and College footballs are same size) sized football is the Under Armour 695XT football. Runner-up goes to the Spalding J5V Advance football which we used for several years prior to our new partnership with Under Armour. For kickers and punters ages 10-12 we recommend a ‘Youth’ sized football such as the Under Armour Youth composite football. These kicking footballs can be purchased at KickingWorld.com or at WizardKicking.com. For kickers and punters ages 12 or younger we recommend a composite (rubbery feel) football. For kickers and punters 13 and older, it is critical that you practice and play with an authentic leather football. In HS and College if you are practicing with a composite football you won’t get the true ‘feel’ of a game ball and will set yourself up for failure. A composite football is overly forgiving with foot to ball contact. A composite football travels a solid 3-5 yards further than an identical kick would with a genuine leather football. While composite footballs are substantially cheaper (typically half or more the cost) than a leather football, you will be hindering your performance and growth as a kicker/punter in HS and beyond. We do however recommend a composite football for our youth specialists ages 8-12. Most KICKERS will prefer a fatter football and most PUNTERS will prefer a narrow football. This statement is based on logic and experience at the over 40 camps a year we do where we see thousands of specialists of all ages and skill levels. The reasoning behind this is because with kicking, the most important aspect to achieve fundamentally to ensure a successful kick is Proper Foot to Ball Contact and with a Punt, the Drop is paramount. Because of this, a fatter (think more stubby/wider) football will allow more surface area for your foot to strike and it not only increases the sweet spot and minimizes the negative effect of a slightly imperfect hit, but the fatter football also creates more ‘bounce’ or compression when the ball is struck by your foot. Because of this I truly believe the best football for a kicker in a game is the fattest, most worked in football you can find. For punters, I feel because most youth and HS students’ hands aren’t full grown yet, a more narrow football allows the punter to ensure a better grip and more consistent drop. Some footballs feel like they just boom off your foot (we call this pop). While other footballs don’t seem to go as far and even sometimes hurt your foot at impact (especially on a cold day). My favorite ball for kicking is the Under Armour 695XT or the Spalding J5V Advance football. I think they both have a lot of ‘pop’. We like them because they are a little ‘fatter’ than most footballs, so they are more forgiving with foot to ball contact and they bounce off the foot nicely. I think some of the leather balls out there are too tough of leather and don’t have a nice feel. I’d equate it to a Titleist Pro V1 golf ball vs a Top Flite ball. One is like a rock (Top Flite – cheaper ball), and the other feels amazing off the face of the club (soft feel – nice touch). Always try to find the softest leather football you can find! Many times the fate of your footballs are unfortunately left to the Quarterback. This could really foul you up. If you’ve played the last 2 years on a team with one quarterback with small hands (most likely he liked a less full football) and now in your Senior year you have a new quarterback with larger hands (most likely likes a more pumped up / fuller football), this could cause a serious issue. I would do everything in your power to have some control over the inflation of the footballs you kick in the game. If possible, ask to swap out the kicking football from the quarterback ball on all extra points at a minimum. Even better, try to do this for field goals too (most of the time they won’t though – because there is less time to set up the play). At worst, be sure to have your optimal football for your kickoffs. If you notice the Quarterback is inflating the football extremely low or extremely pumped up (think 14+ PSI or 9 PSI) then you should definitely say something to the coach and try to work out a compromise. Using a pump with a pressure gauge to inflate your footballs is the surest way to prepare your kicking football. If you don’t have a pressure gauge, how hard should a leather football feel by squeezing it? Great question! I would say you should be able to press your thumb into the ball with about 1/4″ of depression. If you’re able to sink your thumb in there 3/4 of an inch or a full inch, the ball is way under-inflated! If you can’t press the ball inward at all, then it’s most likely over-inflated. The best kind of pump is a dual-inflation ball pump and this one by Tachikara is my favorite. We’ve all heard about the ‘Deflategate’ scandal with the New England Patriots and Tom Brady doctoring up the footballs by taking air out of them before the games. Well as you’ve probably figured out by reading this article, there is certainly a major advantage or disadvantage for kickers and punters based on the proper or improper inflation of a football. In addition to inflation and getting the correct PSI in your footballs, here are some other things you can do to maximize the effectiveness and carry/distance of your football for kicking and punting. Kick and Punt the football as much as you can to ‘break in’ the leather. Even the softest natural leather footballs are still fairly rough/firm at first. It requires sometimes kicking a football 1,000+ times before it can truly be broken in! This is rather extreme, but you could slightly dampen the football with a quick/light rub of a damp cloth. Then put the football in a dryer with a damp towel for 10-15 minutes on a medium heat cycle. This will help expand the leather and ‘fatten it up’ more quickly than waiting 1-2 years of kicking to have the break in period naturally occur. Be careful not to over wet the football as it will add weight and possibly even water log the football, thus negating any positives you accomplished in breaking in your football. Do not leave your football kicking bag in the rain outside (or in the bed of your truck)! One of my students in Central Texas left 6 brand new footballs in his kicking bag overnight in his truck bed. The next morning at our lesson he had a bag full of waterlogged balls. They never quite recovered and he had to end up purchasing new footballs again. Always keep your kicking bag in your locker room or safely with the coaching staff. A safety side note – if your footballs are noticeably heavier after a rainy game or practice, give them a day or two to dry off completely in the sun. Sometimes they recover just fine, but in heavy rains or if they were sitting in water, they are never the same and you might as well throw them out. You can really hurt your leg both with kicking and punting if your ball is water logged. Your leg is not used to that extra weight and it can definitely contribute to a hip/quad/etc injury. If you’ve ever kicked one of those footballs that is so dark in color with little to no grip left on it and the leather is super soft, you will know what we call a bomber ball. There is no greater feeling as a kicker than blasting a 50 yarder with a bomber ball that seemingly carries forever past the uprights. It’s like a golfer ‘puring’ a 7 iron shot that comes off the club face perfectly and you barely hear/feel the ball, it’s like swinging into a stick of butter – so smooth! Everything just feels right and it comes off your foot with authority and minimal effort. If you can turn your footballs into a bomber ball, or be fortunate enough to inherit a bomber ball from the old ‘kicking balls’ stash at your school, you need to hold onto it and use it for all your kickoffs in game! You will instantly add 3-5 yards (for a typical HS or College level kicker) to the distance of your kickoffs and field goals! Most refs are judicious about not letting obviously ‘over-worked’ balls into play, but many times they are more lax with the rules on the football you use for the kickoff. So keep this in mind and try to maximize your distance in any way you can while staying within the rules. I discuss this in detail at our camps, private lessons and in my DVD and Book but a simple, short answer is actually a scientific equation. For kicking, I believe that precise foot to ball contact is THE most critical fundamental aspect you must consistently achieve to ensure further and straighter kickers. Improving your leg speed will also help you to start adding distance to your kicks, immediately (as long as you stay consistent with foot to ball contact and don’t swing so fast that you become inaccurate with your foot to ball contact). The Spalding J5V Advance (not silver or gold) is the exact football that we have used at our camps for several years. Thanks to our recent partnership with Under Armour in 2016, we now use Under Armour 695XT footballs at all our camps. Purchase (5) or more footballs for a very favorable unadvertised price (use code ‘UABULK‘ at checkout). Wilson is probably the largest football manufacturer and their Wilson 1001 football is also a nice ‘fat’ football. I do not like Wilson’s 1005 or GST series (the 1005 is too narrow and the GST is way too hard of leather and difficult to break in). I do however recommend the Wilson GST Composite football for rainy/wet HS or College practices as it is more water resistant and you won’t ruin your kicking footballs. They are very affordable at Academy Sports & Outdoors. We use the Under Armour 495 composite football for rainy lessons and camps. And of course, if you are working toward playing professionally, the gold standard is the Wilson ‘Duke’ NFL Football. High-Quality kicking footballs are not cheap. Typically (as of 2016) you can expect to pay between $80-$100 for a genuine leather football such as the Under Armour 695XT or the Spalding J5V Football. If you use our special discount code ‘UABULK‘ at checkout on KickingWorld.com/shop, you will save quite a bit of money when purchasing the Under Armour ball from us! 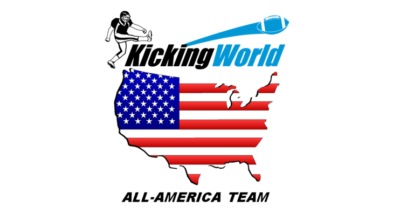 Purchase kicking balls from us directly at KickingWorld.com and if you order (5) or more footballs, use coupon code ‘UABULK‘ for a very favorable unadvertised price.